Residents of Langdhorbi and Dhigala are not happy with the delay in construction of suspension bridge over Mangdechhu at Rindigang under Bardo Gewog in Zhemgang. Villagers said without a bridge, people of two chiwogs are regularly confronted with transportation problem. Langdhorbi is one of the most remote chiwogs of Bardo Gewog. It takes and almost a day to reach the road head at Rindigang. Rindigang is a small temporary business settlement along Gongphu-Panbang highway. Locals said without a bridge, they have to walk on foot through rough terrain with horses carrying the commodities, every day. The gewog’s mangmi said since horses cannot tread through the existing bridge, they have to carry things on their back. “Every summer and winter, we have to fetch our essential items from Rindigang. The horses cannot use the existing bridge,” said mangmi Tshering Tenzin. A local from Dhigala, Pema shared without a bridge, the farm road in their village could not be fully utilised. 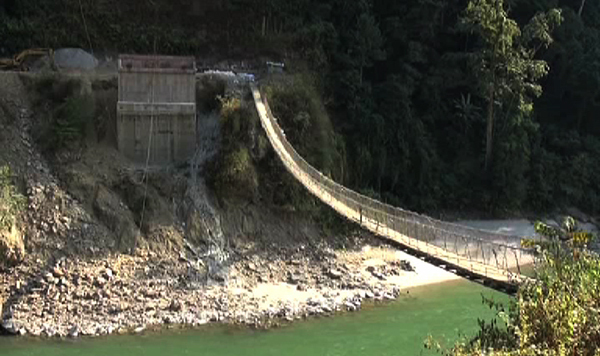 The Department of Roads officials at Tingtibi said the delay in completion of the suspension bridge over Mangdechhu was because the initial design had to be reworked. The contractor also did not agree to work at the contract bid value and had been negotiating. However, Road officials said almost 60 percent of the works are complete. And by 2018, it will be completed as per the new agreement with the contractor. The two chiwogs of Langdhorbi and Dhigala has over 130 households.